An Easter trip to the North West is always something to look forward to but the weather on the drive up on Good Friday was less than inspiring, rain, cloud and murk. Martin and I arrived with plans to do a wee run but these were soon shelved in favour of tea and biscuits at the hostel. Allan, Kate and Adam went off to inspect the waterfalls on the path leading up to Sail Mhor and Kenny and Alison arrived having done the Corbett Beinn Liath Mhor a Ghiubhais Li (soon to be known as the Corbett that should not be named). Kenny certainly wasn't himself when he arrived, having discovered when back at the car that his wallet had developed an attraction to the Corbett and jumped from his rucksack onto the hillside somewhere. A search party for the next day was soon formed and yet another ascent of the Corbett beckoned for Kenny. Another dreich and murky day showed itself on Saturday and not feeling too inspired, myself, Martin and Claire headed off east to Dingwall to do the Cioch Mhor hill race in search of better weather and home baking. A tough race involving lots of mud, rough ground and two thigh deep crossings saw Martin and Claire both pick up prizes, I just contented myself with the tea, sandwiches and cake at the finish. Meanwhile back in the Fannichs news reached us on the wires that the search party of Ian, Nigel, Kate,Allan and Kenny had not only found Kenny's wallet on the summit of the Corbett it had also gained £50 overnight, no excuses for not paying the meet fee now. Chris had pedalled off from Black bridge and gained another two Graham's and a Corbett, Paul, Phillip, Antti and Adam bagged the two westerly Fannichs reporting soft snow but otherwise had a good day. Alison, led Cathy and Fiona on a recce of some climbing crags near Mellon Udrigle which I'm sure also involved tea and cake. 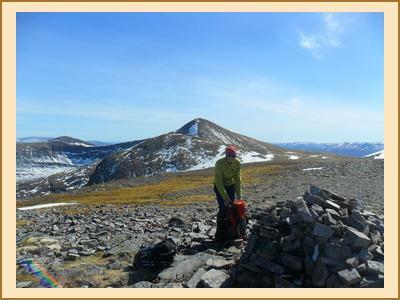 Sunday arrived in a blaze of sunshine and blue skies, a great day to be in the hills. Fiona and Adam headed to the Deargs and bagged two of the munros, Martin and Alison did a round in the Fannichs gaining 3 munros and a top but losing a hat, Antti, Claire, Paul and Ian gained the 4 easterly Fannichs, Nigel and Chris cycled along Loch a Bhraoin and gained two Graham's with Chris also adding in Creag Rainich but losing a pair of sunglasses, Philip and I decided it would be rude not to spend the day on An Teallach and had a great day in alpine conditions and dropped straight back to the hostel where we nearly caught up with Kenny who had been up Sail Mhor, no wallet incidents this time. A bit further south Allan and Kate walked in from Gruinard to climb Beinn a Chaisgein Mor, a long day of 32km, good effort, even more so as they made it back in time for the meal we had booked at the Dundonnell hotel that evening. Monday saw us all disperse except Nigel who was staying away for the week bagging those pesky Graham's and he headed for Beinn a Chaisgein Beag, Ian headed back into the Fannichs and Kate and Allan went up Beinn Enaglair while Adam, Alison and Kenny were disturbing the pine marten sport climbing at Moy. Martin and I dithered but eventually settled on a wee Graham down strathconon. Chris also added to his graham tally with the two hills approached from Inchbae. 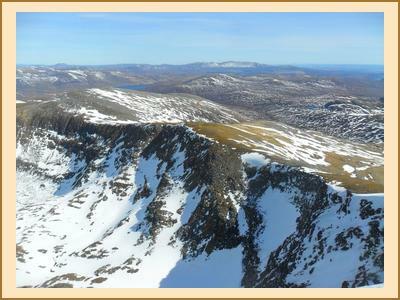 By my dodgy calculations club members were on 14 separate munros, 6 corbetts (some multiple ascents! ), 8 Graham's and took two prizes at a hill race, oh and lost and found various items. Another great weekend.